Steve Cooper, CEO of TrueBlue, had planned a three day offsite retreat at Willows Lodge when he discovered the option to do a leadership workshop with horses. He was eight months into the re-branding of his company, pulling several individual companies under one name. The team, who came from many different backgrounds and locations, had never truly worked together. 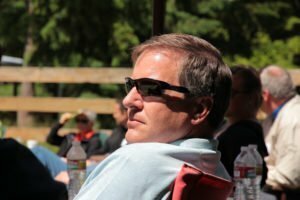 As a CEO interested in developing the team to share one result instead of many, Steve was on the lookout for creative ways to bring about team growth with lasting effects. He scheduled a half-day session with Amanda. When the team heard about the workshop with the horses, there was a lot of curiosity and some anxiety over what they were going to do. Their qualms were quickly forgotten as the opening activity began. The team watched closely as they were introduced to the herd. 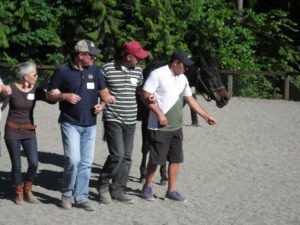 Silently, the horses were brought and released in the arena one by one, and they witnessed the group dynamics change with each new addition to the herd. Then the established behaviors altered once more as limited food was added to the mix.